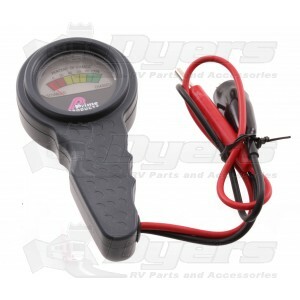 Portable hand held battery meter is great for all types of 12V batteries. For all types of 12V batteries: Auto, Marine, RV, Motorcycle, and more! Large easy to read color display shows percentage of charge. Also indicates undercharge or overcharge. Simple to use and designed to fit your hand. Pre-wired alligator clip for negative hookup (15") and lead wand (16") for positive post.